Age: The older the air conditioning system, the more apt it is to start exhibiting problems. AC replacement can save you money in the long run because the newer the unit, the more efficient it will function. Condition: Constant repairs to an older cooling system add up to costly maintenance. Replacement, on the other hand, makes more sense financially. 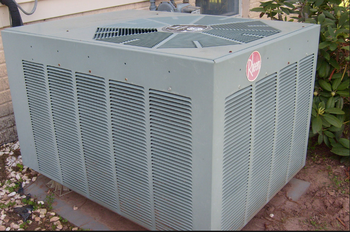 Efficiency: Modern day air conditioning systems have improved in efficiency and the technology has advanced above and beyond systems of years ago so if your AC unit was installed way back when, it just might be time for replacement. Other factors to consider are how often your AC system runs, where you live and the type of refrigerant your old system uses. Also, if you have noticed more dust in your home or if your AC unit is making more noise than it used to, it most likely isn’t operating at full cooling capacity and you might see an increase in your cooling and heating bills, which is an indication that the system needs to be replaced. Your home’s air conditioner is meant to remove humidity from the air, making your home more comfortable so when the system is working properly, the temperatures will remain consistent. If you see fluctuations that seem off to you then you very likely have an AC malfunction.That is the time to weigh the costs of AC repair against the expenses of an entire air conditioning system replacement. HVAC Pinellas Park will be able to answer any and all questions you have in regards to your home cooling and heating system. Ultimately we, at HVAC Pinellas Park, recommend that you let our experienced technicians assist you in the AC replacement decision. Our company does business in a straightforward manner and we will never force a customer to replace their air conditioning system. The final choice is always up to you. That being said, if our professional AC installers determine that you would be better served by an air conditioning system replacement over opting for repairs, they will be honest with what they feel is to your advantage. For honest assessment and diagnosis plus a fair price, call HVAC Pinellas Park today.